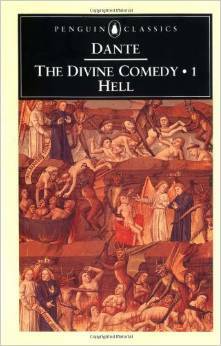 It seemed appropriate, since the Bay Area is currently gripped by a heat wave, to reread Dante’s The Divine Comedy beginning of course with Hell. I’m using Dorothy Sayers’ translation in verse, and finding it surprisingly readable. I especially appreciate her “Story” summary at the beginning of each Canto, and her “Images” at the end, all most helpful and clear. It was also appropriate, in this heat wave, to arrive at our local parish church, St. Peter’s Oakland, surrounded by its courtyard demolition. The garden and patio will be lovely, to be sure, when finished, but in the meantime we are negotiating chicken wire fencing that guards churned earth and pavement slabs. We enter the church, not ceremonially up the steps to the open narthex, our normal route across the threshold, leaving the public space to enter the sacred, but through side doors, maneuvering through back hallways. So between the heat pushing down upon us like a great closing lid and the courtyard disorder, Dante seemed quite at home in my little brain. Then, to this turmoil was added the Epistle and Gospel for today, taken from the Sixth Sunday after Trinity in our poetic Anglican Book of Common Prayer. The readings seemed to be all about sin and death (St. Paul) and hell and judgment (Our Lord). We don’t speak of sin, judgment, and hell these days (in polite society, or rather politically correct society), and try to avoid speaking of death. I had forgotten how these Scripture readings appear like sudden flames in high summer, hard words not content to be safely corralled in Advent or Lent later in the year. And these words are so out of fashion. Today’s culture claims there are always reasons for why we harm one another and ourselves, always explanations, always escape from judgment by changing words and banning others from discourse. It is interesting that Christ not only mentions judgment in this passage but Hell as well, and we are to be judged for the simple sin of disrespect, calling someone a fool. “Whosoever shall say to his brother, Thou fool, shall be in danger of hell-fire,” Christ warns in St. Matthew 5. Such a delicate sin, it would seem, even a lighthearted sin, silly really, part of me secretly says, calling someone a fool whether in thought, word, or deed. Yet on second look, it seems more serious, something spawned by pride, an arrogance that slides subtly into our speech as it takes hold of our hearts, like a snake constricting our love. For love is the opposite of pride. Love is the sacrifice of self for the other, not the uplifting of self over the other. Words matter. Today especially. Sin is banished by embarrassment. Judgment deserted. Hell has long been hidden quaintly in fable and fantasy. Or has it? We pretend death does not await us… are we pretending about Hell? I’m not too far into Dante, but the third Canto places us at the Vestibule of Hell, Hell’s Gateway. Spirits whirl about, distracted, following something here, then there, all the while groaning and shrieking and turning in anguish to keep up. Sound like our world? These are those who, when given the choice of Hell or Heaven, choose to not choose, to remain neutral. They are the undecided, those called by St. Paul “lukewarm,” who are neither for God nor against him. Even Hell spits them out. And so they spend eternity running after the latest thing, just as they did on earth. As Sayers points out, Christian eschatology allows us to choose Heaven or Hell. It would make sense that some choose not to choose. Dante could see our world; his world must have been similarly sophisticated. I’ve known many people in this vestibule, or headed for it, inside the Church and outside. They slide along in a colorless and unfeeling world by banishing words that are uncomfortable or perhaps too true, too painful, to face. As a Christian I am glad to be reminded of hard words, thankful to be forced to face sin and Hell and judgment. The facing makes it far more joyous to be given the antidote to sin and Hell and judgment, an antidote in those same readings of today. And so, St. Paul explains, in one of the most profound and possibly difficult passages in his letters, that we are baptized unto death. He says that when we are baptized our sins die with the “old man,” the sinner in us. And as part of Christ’s body through this baptism, we follow Christ into his own death in this way, but we also follow him into his new resurrected life. He is the Way, the Truth, and the Life. This is good news indeed, real gospel. These are strong happy joyous words of truth. I would rather know and face my enemy – sin – that old man within me – so that I can die a bit so that I can live a lot. I don’t want to chase the latest idea, blown about by the whirlwinds of pride and arrogance, screaming in anguish and doubt and indecision. I want to know the truth, face life as it is. The Church helps with this by reminding us, again and again, what is real and what is not, what is true and what is false, through Scripture and Sacrament, through Council and Creed, using words carefully chosen and honed and perfected through two thousand years. We cross the vestibule and enter, not Hell, but Heaven, every time we enter a Church that holds these words close to her heart. This entry was posted in Uncategorized and tagged Book of Common Prayer, Christ, Dante, death, heat, Heaven, Hell, Holy Scripture, judgment, meaning, Sayers, sin, spirits, Vestibule, words. Bookmark the permalink. I’m so impressed that you’re reading Dante! It’s on my “should do” list but I’ve never really attempted it. The gospel reading, though, about calling one’s brother a fool – that one bored through my brain about a year ago. You’re right, it does sound so frivolous, and yet this sin is tantamount to murder, as Jesus says, because it makes of the brother a mere object on which to glorify oneself, not a person. What a reversal of heart it calls us to!